Sundays — Sun: 8:30 a.m., 11 a.m.
Holy Days — Holy Day: 12:00 p.m.
St. Boniface Church was established in 1836 and named for the Apostle of Germany. It is the second oldest Catholic parish in the city of Louisville and the first church built for German Catholics. Father Joseph Stahlschmidt was the first pastor. Diocesan clergy staffed the parish until 1849 when Bishop Martin John Spalding asked the German-speaking Franciscan priests of Cincinnati, Ohio, to take responsibility for the parish because of the high influx of German Catholic immigrants. After 148 years, the Archdiocese of Louisville resumed responsibility for the parish. The original church stood on the site of the parking lot and school. The school opened in 1844 and in 1967 became Pope Paul VI School. This school closed in 1969. 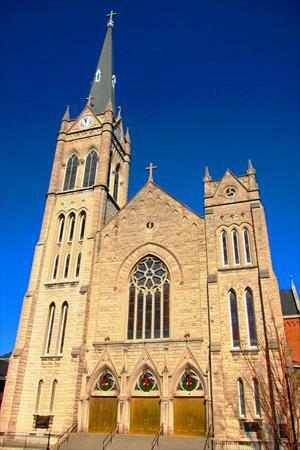 The present church building, built in the Gothic style, was dedicated in 1900. It replaced the Romanesque style church, which proved inadequate to meet the needs of the growing parish membership. As the neighborhood changed over the years, with the building of Clarksdale, the medical complex, and the present creation of Liberty Green, the focus and mission of St. Boniface have changed. The parish is still grounded, however, in its urban mission to the poor and homeless, characterized by service and advocacy. One of the ministries of the parish is Nativity Academy at St. Boniface, which replaced a former after-school program for neighborhood children. This school, founded by Father Timothy Hogan, is modeled after the National Nativity model, which seeks to educate urban youth. It is co-sponsored by the Ursuline Sisters of Louisville and the Xaverian Brothers. The approximately 300 parishioners of St. Boniface Catholic Church welcome those who wish to worship with the community and be of service to others.